Every heating systems is checked when we inspect your home. This is one of the most important parts of our job, since a faulty furnace can be deadly. According to the Consumer Product Safety commission, 102 people were killed by carbon monoxide from faulty heating appliances in the 2002 alone in in the US. There is no substitute for proper maintenance of you heating system. All homes with combustion appliances must have carbon monoxide detectors! Smoke detectors are no protection against this colorless and odorless poison. We found this receipt on a furnace that did not work. It stated it was "checked and serviced" less then 2 months before. This receipt was provided by the seller and it was a flip home. Always have your furnace checked by a reputable company, and take the word of a sellers service technicians with a grain of salt. I always recommend that my clients call the service company and ask them what they did, and how long it should last. 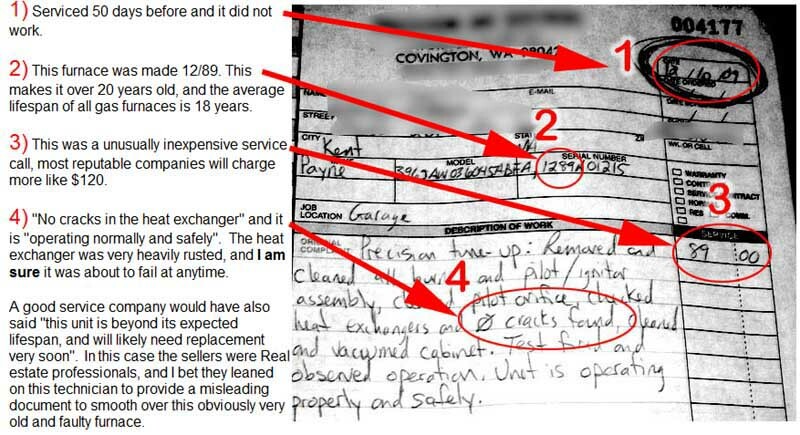 There is no excuse for such a positive report of this expired, broken and dangerous furnace. I believe this company was paid to produce this receipt, not to do his job.